I have read all of the anthologies Nancy Guthrie has edited - on Christmas, Easter, suffering and on dying - more than once and have given away oh so many copies of them all. These are truly wonderful, wonderful books. But until recently I hadn't ever read anything written by Nancy Guthrie herself. Nancy Guthrie and her husband lost a baby daughter at six months of age to Zellwegers's Syndrome. Hope's condition was discovered at birth and the Guthries spent the next six months loving their precious daughter and painfully anticipating her death. As carriers of this syndrome, the Guthries took surgical steps to prevent them from having further children. The procedure reversed itself and a couple of years after Hope passed away, Gabriel was born, also with Zellwegers Syndrome. He passed away one day short of turning six months old. Holding on to Hope, based around the book of Job (from the Bible), was written by Nancy Guthrie during the months between Hope's death and Gabriel's birth. 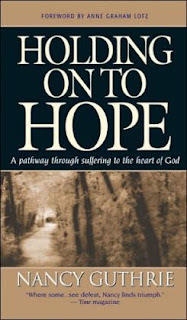 It is a book about suffering and dying, leaning on God and trusting in Him. Like Jerry Bridges' books, it sits firmly on the foundation of God's sovereignty. I feel as though I have read, thought, prayed about and written quite a lot about suffering and death in the last few years. In the western world, where life is so easy, we don't (I generalise here) manage sufffering and grief well. We are outraged by it. And at one level this is entirely correct. Death is appalling. But we rage in ways that are selfish and godless. We think these sorts of things just shouldn't happen in this day and age. So for me, the last few years has been about working through what ought to be a Right response when crisis comes. What makes Holding on to Hope so very good is that it takes the theory of what is biblical in responding to suffering and grief and applies it squarely to a real life situation of horrendous suffering and grief. There was no fist shaking at God. Nor, at the other extreme, was there a facade of stoicism. The grief was real. I don't doubt that every page of her manuscript was tear stained. But it was godly grief. A grief founded in trust and a deeply faithful acceptance that God had their lives and circumstances sovereignly, lovingly and wisely in hand. This is a book to share with someone in grief. To help them grieve well. It concerns a specific situation - the loss of a child - but it will speak to all situations of grief. This is a book to share with someone for whom life is good - that they might use the peaceful times to prepare for times ahead when suffering will swiftly or eventually come. This book is inspiring and challenging and tender and gentle. It's short - I read it over a couple of evenings. And at least in the copy I have, there is an eight week study that digs deeply into Job and traverses the Bible on the subject of suffering and grief. I would love to put some time into this at some stage. And this book is an excellent companion to Nancy Guthrie's anthologies on suffering and death. Reading this book will be time well spent. Reading it and then sharing a copy with someone else will be a gift. God in His love always wills what is best for us. and in His sovereignty He has the power to bring it about. I have just spent the last month immersed in these three books by Jerry Bridges. Respectable Sins - about the sins that we may not even be aware of, because they blend in with what is well tolerated in society...pride, discontentment, grumbling, selfishness (it's all about me) and anxiety to name a few. 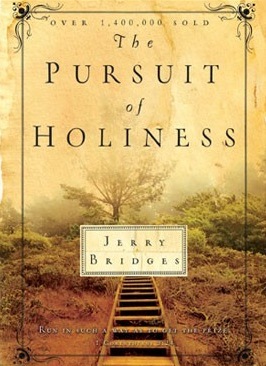 The Pursuit of Holiness - one of those books often to be found on many Christian bucket lists of must read books, and rightly so. A great companion to Respectable Sins as it maps a pathway for pursuing holiness and godliness, that veers away from sins both gross and respectable. Trusting God - how to maintain that holiness, godliness and belief that God is sovereign and that Christ's death on the cross is enough when things are not going smoothly. 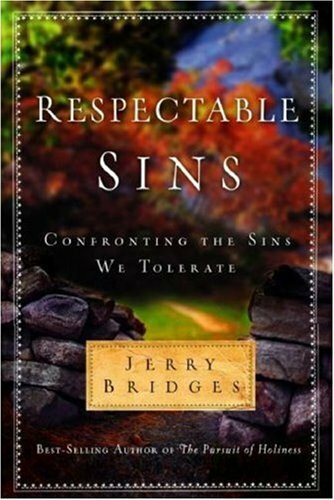 Jerry Bridges writes clearly and pastorally. In reading them I felt nurtured and challenged, taught and counselled, affirmed and encouraged. Encouraged in the best sense of the word. Jerry Bridges is a humble man and in all three books he genuinely and sincerely gives God all glory and honour. If you want to see humility in action through one who holds wholly to the view that God is completely sovereign (that is, in control of all things), loving and wise, pick one of these books and delight in his gentle but strong words. He's not afraid to say the hard things. But he is by no means harsh. I'd like to read some more of his books, including The Joy of Fearing God and The Discipline of Grace, but three is enough for now. I'll save the others for another time. From the mouth of a seven year old very close to my heart after he overheard my husband and I talk about being worried about something. I know how to stop worrying. Then have a drink of water. And then sing a song. Spontaneously delivered, wise and wonderful advice. "Why, O LORD do you stand far off?" "Why have you rejected us forever?" But each of these psalms ends on a note of trust in God. The Psalm writers did not allow their whys to drag on. They did not allow them to take root and grow into accusations against God. Their whys were really cries of anguish, a natural reaction to pain. From chapter eight in Trusting God by Jerry Bridges. Running: a day late on this. I was fairly wiped out after Easter and could hardly string two verbal words together yesterday, let alone face a computer screen. Grateful: to God for all that Easter is and for the time to reflect on His amazing grace and goodness to us. Eating: nothing. But we had lasagna for tea. Home made. Lasagna is pretty labour intensive in my view. But everyone likes it. Last year (I know, I'm very slow when it comes to these sorts of culinary breakthroughs) I worked out as I was making a lasagna to give away, that I could make two - one to give away and one for us to eat. That took out some of the intensity from the labour. And last week I figured if you can make two at once then you can also make four at once. So we are eating one (tonight and probably tomorrow night too) and there are three in the freezer ready to give away or eat at a later date. Cooking in bulk for the freezer is not new to me...it is the type of cooking I do best. But bulk lasagnas - that's new and it's wonderful. Drinking: nothing. But I am about to boil the kettle. Cup of tea, anyone? Reading: the Bible from this reading plan. Currently a week behind. Not too worried about that. I'll catch it up with some double readings here and there. Also reading: Trusting God by Jerry Bridges. This is my third Jerry Bridges book in a month. I love this man's take on the Christian life. But this will be the last of his books I read for now. I'm not taking in quite as much with this one as the other two. It's probably time to put his books down for a while. But what a wonderful time it has been. Figuring: I was a tad hasty in announcing my running career on Facebook a couple of weeks ago. That comment - that I had taken up the C25K challenge - was met with all sorts of lovely, encouraging and endearing comments. But my running career ("running" seems a bit over the top...thinking Cliff Young shuffle really minus the long distances) has been curtailed by an erratic schedule, the need for better shoes which will have to wait and the degree of my unfitness pitched against my age and the length of time that has passed since I did regular exercise. So the current plan is long brisk walks on the treadmill and a bit of rowing on the rowing machine. Until further notice. Wondering: if Google's decision to shut down Google Reader will mark the beginning of the slow death of small blogs. I don't ever complain when Facebook and Google make changes. They offer us these amazing free services so we can hardly complain. And this isn't a complaint. Just a wonder. Thinking: about not complaining and gratitude and hope after taking a tour down my own little blog memory lane a couple of weeks ago. A few cringeworthy moments in that tour as well but I was glad to have these three reminders, especially in light of the Jerry Bridges books I've read this last month about holiness, tolerated sinfulness and trusting in God. Off: to clean up the kitchen and make that cup of tea.